Toronto slotback SJ Green, B.C. linebacker Solomon Elimimian and Argonauts defensive lineman Victor Butler were named the top performers for Week 3 of the CFL season. 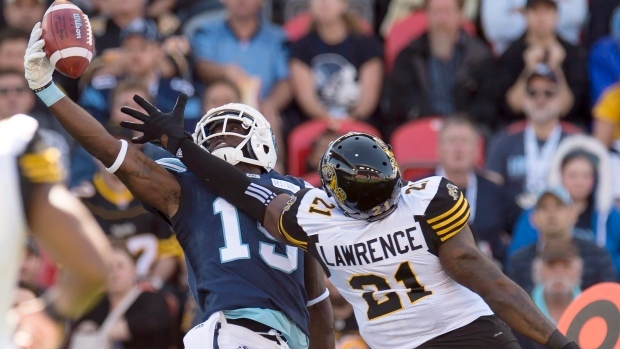 Green had a personal-best 210 yards and one touchdown on 10 catches to help the Argonauts come back and defeat the Ottawa Redblacks 26-25 on Saturday. The South Florida alum had his biggest moment in the third quarter when he caught a 55-yard pass from quarterback Ricky Ray to give Toronto its first lead in the game. Butler had eight tackles, including three quarterback sacks, in the victory. Elimimian recorded 15 tackles in the Lions' 26-16 victory over the Montreal Alouettes on Thursday. That number tied his franchise record for tackles in a single game and was one shy of tying the league record held by Reggie Hunt.